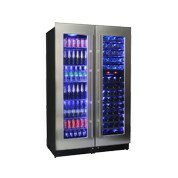 Keep your drinks cold while on display with one of our high-quality commercial fridges. Don’t try and squeeze all your drinks into a little area, purchase one of our affordable, tall products to neatly stack your cans & bottles. Have your goods out on the other side of the counter for customers to have easy access. Our products are ideal for clubs, cafe, & restaurants. Upgrade from an energy draining machine and grab one of these great deals to add to your shop. Our products come in a variety of sizes from 1 door, 468L volume, to 1 or 2 door 1000L products that are perfect for bars. With easy to adjust temperature controls you can set your drinks to the optimal temperature and know your customers will be satisfy. understanding the shops dont have a lot of space, we stock modern designs that don’t take up a lot of room in your shop with its compact width & length, but extra height. Shop our glass door products online today to grab a value deal. Shop online with a trusted site at MyDeal and experience a flawless process. Within a few clicks, the product that your business needs can be add to your cart and purchased. Don’t waste your limit time going to warehouses looking for the best product, shop discount prices online. With plenty of extra features, our products won’t disappoint.